The iStick Pico X retains a small sized box mod while upgrading with a new intelligent wattage recommending system. Having an ergonomic design with a rubberized grip, the iStick Pico X gives you a comfortable and smooth feel when you hold it in your palm. It accepts single 18650 battery and can fire up to 75 watts of power. With an ultra light weight and compact size, it can easily be transported everywhere. Grab this iStick Pico X to discover the simplicity, practicality and versatility of a vape setup! Intelligent wattage recommending system: the iStick Pico X upgrades with a new intelligent wattage recommending system which tells you automatically the wattage that fits your coil. Soft and smooth to touch: the iStick Pico X features a rubber paint finish, giving you a softer and smoother feel when you hold it in your palm. 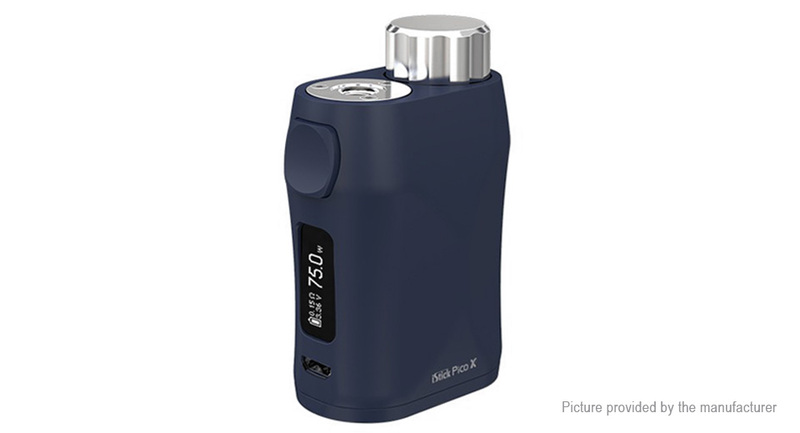 An ergonomic and compact design: with an ergonomic and compact design, the iStick Pico X is very comfortable to hold and carry. Single 18650 mod with 75W output: the iStick Pico X is powered by a single 18650 battery and can fire up to 75 watts of power. Concise display with optional interfaces: the iStick Pico X comes with a 0.69-inch screen that clearly displays all essential information and offers 3 different interfaces for you to choose from: puff interface, time interface and voltage interface. Accepting various atomizers: the iStick Pico X can handle various tanks up to 22mm diameter without any overhang. Functions of Micro USB port: charging: the 18650 battery can be charged in the iStick Pico X through the USB port via wall adapter or computer or charged with an external battery charger.